Hello and welcome to the Randahl Construction: Industrial Concrete Information webpage. We have created this webpage as a concrete resource for educational purposes for potential clients and anyone else looking for general information on concrete. Randahl Construction, Inc. is a general contractor, commercial remodeler, construction manager and we also have a concrete division. This website is dedicated to our concrete division of the business. At first glance concrete may seem like a simple mixture of cement, water and rocks although as you will learn, there is a lot more to concrete than a simple mixture. If you have specific questions about concrete or an upcoming concrete project that you would like to discuss please call us at 763-559-1009! In it’s standard form concrete is made with the combination and mixture of paste, rocks or a collection of sand, gravel, crushed stone, slag, or recycled crushed concrete also known as concrete aggregates. Portland Cement and water make up the concrete paste described above. This paste coats the surface of the concrete with fine small or large coarse aggregates. Then as the mixture begins to dry the paste becomes hard, firm and gains strength to form a rock-like mass due to a chemical reaction called hydration. During the carefully designed mixing stages of the components listed above, the components mix together and create a uniform mass of concrete. Most commonly concrete is mixed at local concrete manufacturers near the construction project site. The concrete product is then transported by cement mixing trucks to the location and always moving and mixing along the way. All concrete projects are different (foundations, retails floors, interior, exterior, industrial warehouse, roads, etc.) so the preparation for concrete on the job site differs from job to job, location to location. Most often, the starting point in the construction begins with a simple removal of the top layer of soil and surface vegitaion, then excavating the high areas of the grade or fill if needed before the concreting can begin. Many different types of tools can be used on the different types of projects because not all concrete areas are out in the open with large spaces to work. Sometimes small tight spaces need to be worked on and then different compactors are made to fit in those tight spots. On the construction site you will often find these types of tools and machinery: cement trucks, bull dozers, backhoes, concrete saws, hydraulic jacks, demolition equipment, welding equipment, power trowels, sharp-edged trowels, hammers, chisels, utility knives, wheel barrows, concrete pumps, conveyor belts to name a few. After the concrete has been put into place, the curing process begins. Concrete curing occurs when the temperature of the concrete is kept at a certain temperature and the concrete is also been protected from the loss of moisture. As a result of the curing process the concrete increases in strength and decreases it permeability. Curing is a vital process in minimizing the cracking in the concrete surface area. Like most construction projects, when dealing with concrete timing is everything. The coordination of the entire project needs to be properly communicated through out, communication between the cement trucks and our construction crew is vital to our success. Some of our main manufactures have satellite technology in their cement delivery trucks allowing our job-site crew to have precise delivery times. At Randahl Construction, one of our strong points against the competition is having a reputation to finish our projects on-time and on budget. Late deliveries, poor communication, and rushed work is not acceptable at Randahl Construction. At Randahl Construction job site safety is a very high priority not only for our team members but also your employees around the job-site. We have created safety programs for all of our construction and concrete team members. If any one of our team members feels that the job-site has become unsafe it is their duty to ste up and notify everyone of their concern. Although concrete projects are already low in the construction industry for job-site injuries, it does not give any reason to not take safety serious. Our team is always equipped to handle the job safely and properly. It is also our job to make sure that anyone who enters the work area is complying to those guidelines as well. In ready mix concrete, cement amounts to 7-15% of the ingredient mixture. Cement is a alkaline material and when wet is defined as caustic which can cause severe chemical burns to exposed eyes & skin. If skin comes in contact with concrete it needs to be immediately washed off and monitored because if discomfort or irritation occurs, immediate medical attention is advised. If concrete gets into the eyes of anyone immediate flushing is required and medical attention is highly suggested. Contact of wet concrete through your skin needs to be washed off as well because this can also cause chemical burns. Proper safety attire is the key to protecting everyone around the concrete job site. Concrete has been a valuable resource for ages, dating back to the ancient times, when a form of concrete was made from volcanic ash and hydrated lime. Although many years have past and some advancements have been made industrial concrete is typically made in a few basic forms depending on the different applications and purposes. Ready-mixed concrete is by far the most common type of concrete seen in the world today. This is the type of concrete that we at Randahl Construction use during most of our commercial remodeling and construction projects and can be seen on the road traveling in the cement mixer trucks. It is batched locally here in Minnesota and then distributed to our different project sites and locations. We have multiple sources for our ready-mixed concrete but some of the most common names are: Cemstone Products with locations in Minneapolis, St. Paul, Dayton, Mendota Heights and all across Minnesota, AME Red–E–Mix, Inc. located in Monticello, Aggregate MN located in Eagan, MN to name a few. 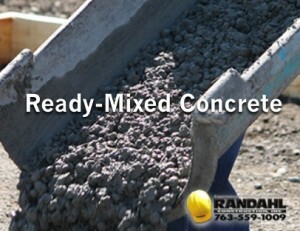 What is Ready-Mixed Concrete? Ready-Mixed Concrete is concrete that is pre-mixed at a concrete batching plant, then transited by truck to the job site in which it is being mixed while in transit and then laid by the concrete contractor. This ready-mix concrete is commonly found in sidewalks, warehouse floors, concrete slabs, etc. Ready-mixed concrete is preferred over on the site concrete mixing mainly because of the precision needed when mixing the components and the reduction of job site confusion. Precast concrete, is a type of concrete that is cast in a factory setting away from the job site so that the products can be carefully watched and crafted. Precast components are typically: structural components, wall panels, stadium risers, bricks and paving stones. Precast Concrete is also know as Architectural and Decorative Concrete. The precast concrete can offer a high strength capacity to support building structures but also have an aesthetic decorative look to it as well. Architectural and Decorative concrete can also be very custom allowing for options such as: Colored Concrete, Exposed Aggregate, and more all making this product custom to each project or application. Accelerated concrete is mainly used on roads and highways where quick drying is essential. Different technology is used to speed up the drying process. A concrete manufactured to reduce water run off. Containing no fine sand Pervious concrete allows water to pass through the concrete in which the concrete promotes filtration of heavy metals, suspended solids and even petroleum products. Structurally pervious concrete is not as strong as standard concrete but is ok to use in light duty applications or areas with light traffic such as parking ramps or neighborhood streets. An environmentally friendly feature about pervious concrete is that this type of concrete filters out harmful sediments in rain/storm water resulting in a better quality water for the land beneath. When commercial concrete contractors combine concrete with reinforcing materials, such as rebar embeded in the concrete mixture to provide tensile strength, it is called Reinforced Concrete. Contractors use Reinforcing to prevent unacceptable cracking and/or structural failure. It is not uncommon to see other items such as steel, polymers or alternative used along with the rebar. Tilt-up concrete, tilt-slab, tilt-wall or tilt up concrete, can be defined in the construction process of a structure when the concrete is poured horizontally on the job site and then the concrete is tilted-up or tilted into place. The ceiling, floors and other walls are then constructed in the same way and then connected together, supporting one another. Concrete Slabs can be simply defined as the structural element of a building. These concrete slabs typically range from 4”-20” thick and create the floors and ceilings in industrial structures. Industrial concrete standards are based on a few properties: Strength, elasticity, hardness and workability. Concrete Elasticity – Elasticity is the ability of the material to resume its normal shape after being compressed. When talking about concrete elasticity, we refer to how the concrete reacts under stress. Typically the elasticity of concrete is fairly consistent at low stress levels but begins to lower at increased stress levels as matrix cracking develops. Concrete Hardness – The hardness of concrete can be determined by the type of aggregate used in the mixture. Concrete Workability – Concrete workability is referring to how well the concrete can be poured, laid and placed into the proper location. Workability is important depending on the type of concrete project at hand. On the job, The Slump Test can be used in order to test the concrete’s workability. The test is done with a cone shaped object on the construction site that is filled with concrete, then flipped over and eventually revealing how much slumping is in the concrete. Concrete is very similar to many other products as the key to achieving a strong, high capacity concrete is done through the process of carefully proportioning and mixing the ingredients (paste and aggregates, or rocks). In a typical mix of concrete, aggregates amount to 60-80% of the entire mixture, so aggregates must be carefully selected and properly controlled to produce a durable, finish-able and concrete with consistent strength. The other percentage of the mixtures are roughly 10-15% cement, 15-20% water and then en-trained air make take up a small 4-8%. The quality of paste (Portland cement and water) determines the character of the concrete. The ratio of water to cement in the paste determines the strength of the finished concrete product. High quality concrete products are created when the water-Portland cement is lowered to a level as much as possible without sacrificing the flow of the concrete for work-ability when pouring allowing it to be properly placed and cured. A mixture of concrete lacking enough paste to fill the void between the mixture of rocks, gravel, crushed stone, slag, or recycled crushed concrete (aggregates) will cause the concrete surface to be rough and have a penetrable concrete. On the opposite side of the spectrum, a concrete mixture with too much paste (Portland Cement and water) in the mixture will create a concrete surface that will tend to be very smooth but have the tendency to crack easily. When talking about concrete slabs, it is very important for the contractor to understand what type of soil materials are underneath the concrete area during preparation. Understanding the moisture, density, and overall flatness of the surface that the concrete rests on is the key to the overall performance of the concrete slab. With the proper knowledge of the soil, contractors can then use the correct compactors for the job because different compactors perform better or worse depending on those variables. Typically graders will prepare the site to a rough grade and then the concrete team takes care of the final preparation of the fine grading in the top few layers. As with all construction projects communication is key in this process ensuring all team members are on the same page. In summary, it is often easy to blame the concrete for poor performance or failure which can be true but problems can also arise from poor soil preparation for the concrete to rest on. Although it is very rare, there are some concrete problems and defects that can happen to concrete. Below is a list of some of those issues or defects when talking about concrete, and also for some issues how it can be prevented. As a customer, you should always be aware of the worst case scenarios in a concrete project, so you have knowledge of what is happening and why it is happening – to protect yourself. Concrete Blisters – Blisters are the small, medium and large size bumps that come to the surface of the concrete after curing, if there is too much air left in the concrete. This can happen during the compaction process or during the finishing process if it done at the wrong time. Cracking in Concrete – cracking is one of the most common complaints in the concrete industry. Cracking in the concrete surface can be a result of several things: drying shrinkage, thermal contraction, restraint, subgrade settlement and loads applied to the concrete. Crazing Light Cracks – is a bunch of fine surface cracks that are visible but don’t penetrate the surface. This typically happens when there is minor shrinkage of the top levels of the surface when curing. Slab Curling – is defined when the edges or corners of an industrial concrete slab rise up or become distorted or also known and distortion. Typically this happens when there is a temperature difference in the concrete top and bottom. Delamination – Delaminations happen on the surface of the finished concrete very similar to the blisters described above. Delamination is described as two levels separating. This happens in concrete from bleed water and bleed air being trapped below the prematurely closed (densified) mortar surface. Concrete Flooring Discoloration – Discoloration is when large or small areas of the concrete surface are a different color then the rest. There are so many factors that could potentially effect the coloring in concrete, no one variable can take the blame for all concretes discoloration. Concrete Floor Dusting (laitance) – This occurs after the project is complete and dust settles on the top surface of the concrete. This dust can be wiped off with a finger tip. The dusting found on the surface of the concrete is composed of cement, water and fine particles and it is called laitance. Efflorescence – is a white deposit that appears once the concrete project is complete. When efflorescence is present a concrete contractor or expert should be notified. Low spots – are an area of the concrete that is not level compared to the rest of the surface. The low spots can affect drainage and are typically from poor lighting during the finishing process and also can be caused by errors in the forms, screeds set up. Overly wet concrete can also cause low spots in concrete. Popouts – a popout on a concrete flooring project happens when a small piece of the concrete flooring surface popsout of place. This does not typically affect the life of the concrete and considered a cosmetic detraction. Scaling – when your concrete is exposed to freezing and thawing concrete will loose surface mortar and this is called scaling. Spalling – are similar to scaling although they are bigger in size. This happens for several reasons. One may be from corroded steel in the reinforcement, impact loads, fire, or weathering can all cause concrete spalling. With our concrete manufactures located all around the state of Minnesota, they have extensive experience in mixing concrete designs to withstand our harsh Minnesota winters and warm summers. Through years of labor, research and testing, Cemstone, one of our main manufacturers engineers exterior concrete, has engineered a concrete solution offering a mixture of concrete that provides an aesthetically pleasing product while lasting longer, requiring less maintenance offering our customers a lower lifetime cost on their concrete parking surfaces. Based in Minnesota, cold weather is something that Randahl Construction has dealt with since our company began 25 years ago and will continue to deal with as long as we operate our business in this state. Laying concrete in cold weather is not our first choice but if it has to be done there are certain precautions that can be taken. Concrete work can be accomplished during even the coldest weather as long as the appropriate precautions are taken. The objectives are to prevent damage from early-age freezing (when the concrete is still saturated), to make sure the concrete develops the needed strength, and to limit rapid temperature changes or large temperature differentials that cause cracking. Although there is some cost to all this, it’s typically not excessive— certainly not when compared to having your crews sit idle, blowing your schedule, or ending up with damaged concrete. 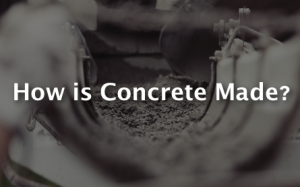 What is “Green” Concrete Recycling? Concrete recycling is an increasingly common method of disposing of concrete structures. Concrete debris was once routinely shipped to landfills for disposal, but recycling is increasing due to improved environmental awareness, federal and Minnesota laws, and economic benefits such as tax breaks for building green construction. Concrete, which must be free of trash, wood, paper and other such materials, is collected from industrial demolition sites and put through a crushing machine, often along with asphalt, bricks and rocks. Reinforced concrete contains rebar and other metallic reinforcements, which are removed with magnets and recycled elsewhere. The remaining aggregate chunks are sorted by size. Larger chunks may go through the crusher again. Smaller pieces of concrete are used as gravel for new construction projects. Aggregate base gravel is laid down as the lowest layer in a road, with fresh concrete or asphalt placed over it. Crushed recycled concrete can sometimes be used as the dry aggregate for brand new concrete if it is free of contaminants, though the use of recycled concrete limits strength and is not allowed in many jurisdictions. Industrial Concrete Information: Benefits of Poured Wall Foundations? Strength – Poured walls are engineered for strength and durability. Value – A poured foundation increases property values and has a lasting value. which speeds up the construction process and lowers costs. Versatile – We can adapt a poured foundation to virtually any design. With all of the variations in concrete products and types of projects, concrete estimates are very tough to generalize. Randahl Construction only works with commercial and industrial applications, meaning we do not service residential needs for concrete. This allows us to focus on our customers and projects in our industrial market. When it comes to standard ready-mixed concrete estimates in Minnesota, we usually meet with the client, perform a site visit, and discuss the project in further detail. Our goal in this process is to learn as much as possible about the project so we can offer you the most accurate pricing for our services. We take pride in our sales team and our estimating crew because we feel it is very important to offer accurate honest numbers from the start. If you are looking for a budgetary estimate on concrete, please use our Quick Concrete Estimate Form or call 763-559-1009 to speak with a Minnesota Concrete Specialists who can help you set budgetary numbers for your project.